Decal on the set of “Devs” taken outside of McHenry Library. Santa Cruz locals saw a little piece of Hollywood this summer when a new FX miniseries, “Devs,” and Jordan Peele’s “Get Out” follow-up, “Us,” were partially filmed in the city. Both productions hosted open casting calls for Santa Cruz residents, and will be released next year. 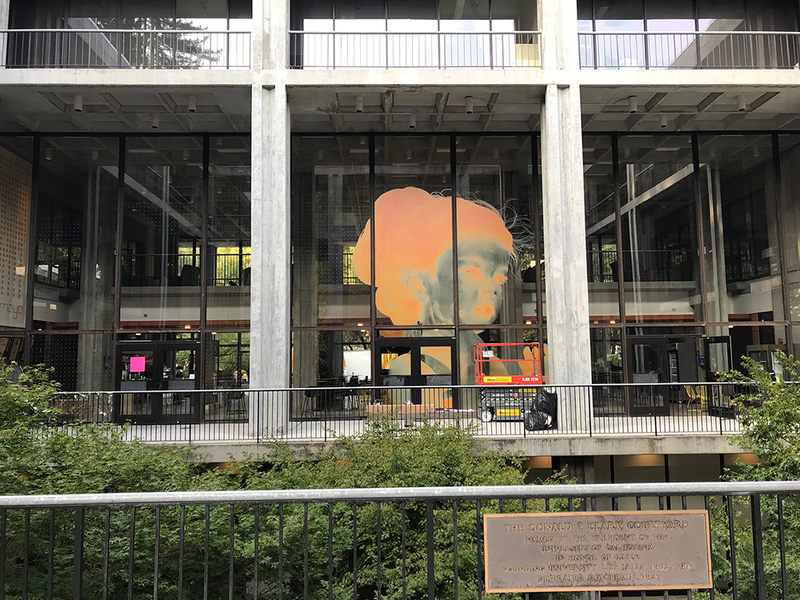 “Devs,” written and directed by Alex Garland, director and writer of “Ex-Machina” and “Annihilation,” was filmed at UC Santa Cruz’s McHenry Library, Quarry Plaza and Science Hill between late-August and mid-September. Set in Silicon Valley, the miniseries follows the story of young engineer Lily Chan, played by Sonoya Mizuno from “Ex-Machina” and “Crazy Rich Asians,” who believes her employer killed her boyfriend. Campus administrators collaborated with series producers in May to organize filming for “Devs” so that it would impact daily campus operations as little as possible. The revenue UCSC gained from filming will be used to support the campus, said Scott Hernandez-Jason, UCSC director of media relations. For example, McHenry Library received $35,000 from hosting “Devs” to be used for repair and maintenance of furniture, and TAPS received about $65,000 from parking accommodations. These will be used to maintain parking facilities and transportation programs like the bike shuttle. Jordan Peele’s newest film, titled “Us,” came to the beaches of Santa Cruz in mid-September for filming. Similar in tone to “Get Out,” it’s a horror-comedy film that centers on one white couple played by Elisabeth Moss and Tim Heidecker, and one Black couple starring “Black Panther’s” Lupita Nyong’o and Winston Duke. Ayo Banjo, a second-year at UCSC, was an extra in “Us” because of his interest in acting and got to meet the director and some of the cast. Other films featuring Santa Cruz include “Chasing Mavericks” (2012), “Dangerous Minds” (1995) and “Harold and Maude” (1971).